Europe led USA 5-3 in the Solheim Cup after the delayed completion of the first day in St Leon-Rot in Germany. The two remaining fourball matches held over from Friday because of bad light were halved in heavy rain on their resumption early on Saturday. Friday's morning foursomes finished 2-2 and then holders Europe won the two completed afternoon fourballs. Saturday's morning foursomes are underway before the fourballs follow in the afternoon. On the fourball's resumption, America's Lexi Thompson kept her cool on the last to hole for half a point after Europe's Melissa Reid had sunk a 15-footer for her birdie. England's Reid, who is 28 on Saturday, said: "I was really buzzing to make that putt because I knew Lexi was close to the hole and the way she was playing she was going to make it." Europe had ended the previous evening on a high when Reid's partner Carlotta Ciganda of Spain chipped in for an eagle two on the 17th to level the match. In the other uncompleted match, US pair Gerina Piller and Brittany Lang came from one down against Germany's Caroline Masson and Sandra Gall to earn half a point. Piller putted in from off the green on the 16th and followed it up with another birdie on the 17th to go one up, but missed a putt to win the match on the last after Gal hit a stunning approach to two feet that was conceded. In Friday's completed fourballs Sweden's Anna Nordqvist and Caroline Hedwall eased home 4&3 against Morgan Pressel and Paula Creamer, while England's Charley Hull and France's Gwladys Nocera triumphed 3&2 over Michelle Wie and Brittany Lincicome. "She is very impressive," Nocera said of 19-year-old Hull. "My plan was to play safe and help her." Hull had partnered Melanie Reid to a 2&1 victory over Wie and Lincicome in Friday's morning foursomes, while Sandra Gal and Scotland's Catriona Mathew earned Europe another point with a 3&2 win over Stacy Lewis and Lizette Salas. Earlier, the foursomes were shared with Pressel and Creamer 3&2 winners over Nordqvist and Norway's Suzann Pettersen, and Thompson and Cristie Kerr beat Karine Icher and Azahara Munoz 2&1. 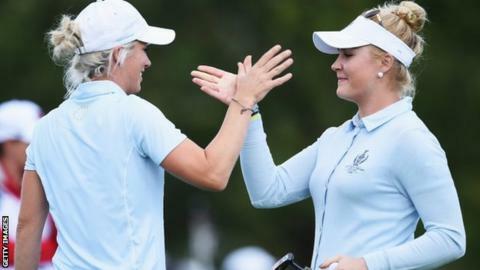 Europe are chasing a third successive win in the women's equivalent of the Ryder Cup, which ends on Sunday with 12 singles matches.